NEURO-ID (Neuroscience Research Opportunity to Increase Diversity) is a competitive research program designed to increase diversity in Neuroscience by providing opportunities to undergraduate students interested in pursuing a greaduate degree and enhance their scientific knowledge, research capability and social responsibility .Research experiences will take place during the semester in one of the UPR research laboratories and during the summer in one of our collaborators’ laboratories in the Unites States. Parallel to these experiences, students will participate in other activities aimed to strengthening their professional development and also at provide a strong understanding of the function and diseases of the nervous system. A novel part of the NEURO-ID program is the integration of components that will expose undergraduate students to the overreaching power of a scientific career through community outreach activities. The proposed training plan includes the integration of biomedical and behavioral research activities to expose students to different aspect of Neuroscience research. The undergraduate students will be selected from Biology, Chemistry, General Sciences and Psychology, allowing the exchange of, and exposure to, diverse research topics and interests. In addition, a mentoring program that includes researchers at the UPR and universities in the Unites States will serve as support system, not only during the undergraduate training program but also through their graduate studies. The integration of “role-models” at the UPR and other universities in the Unites States will provide the selected students with the opportunity to exchange their experiences, difficulties and find answers to questions encountered in the course of their training as researchers. 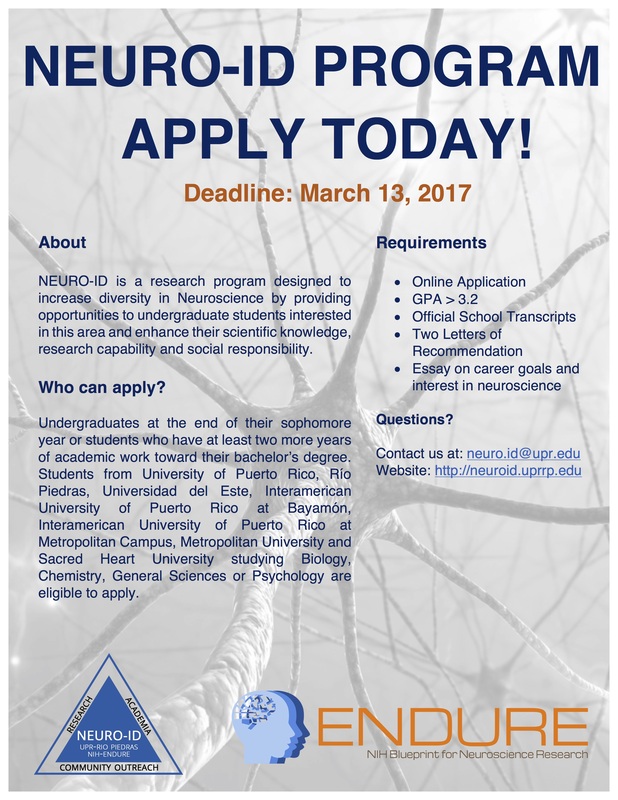 All together, the NeuroID program will serve to develop and validate a combination of best practices and strategies to promote, enhance and strengthen the interest of undergraduate students for a research career in Neuroscience. Undergraduates students at the end of their sophomore year or students who have at least two more years of academic work towards their bachelor's degree.